Today I Chose To Celebrate My Baby's Accomplishments, Not Compare. You are here: Home / Resources / Today I Chose To Celebrate My Baby’s Accomplishments, Not Compare. Today I Chose To Celebrate My Baby’s Accomplishments, Not Compare. It is good to take a moment to celebrate how far our children really have come. Watching this video I am so proud of how well Noah is sitting. He has worked so hard to accomplish this and it was no easy feat. He worked on his core, his balance, his proprioception, and all aspects of himself just to sit up. And he isn’t just sitting; he is sitting up nice and straight. Sometimes we can get so caught up in what are children are not doing that we forget how far they really have progressed, and how hard they worked to get there. Once we meet a goal in our therapy sessions we are on to the next one, often forgetting about what was just accomplished. I have been doing a lot of comparing lately, and I don’t know why. I know we all do it whether we talk about it or not. I get frustrated that Noah has to work so hard to do all of these things. Our sitting marathon seemed to last forever. We waited so long for him to do this on his own. While typical children just sit one day and that is that. So today I am going to celebrate Noah and his accomplishment. He is sitting perfectly. He is sitting and putting his hands up on a pretty awesome toy. Sitting has expanded his world and allowed him to experience new things. He has done countless sit-ups, swinging sessions, and ball exercises to get here and I am unbelievably proud It doesn’t matter what age he was when this happened… it happened, and it happened because he is one determined little man. It is your turn to brag, what recent accomplishment has your child made that you can celebrate today! Let’s celebrate our children’s accomplishments, not compare them….whose with me?! living in rural australia, we dont get alot of support from special services, so every thing paul has accomplished in his 16 months he has bassicaly done on his own. he is now able to get up and down from sitting, is just starting to crawl properly and is even starting to try and pull himself up more often kneeling at a chair to play. we are very proud of everything he is doing. Hi Sonia! Just to say I bought the books Abbie suggested a few months back and have found them really excellent – keep up the good work sounds like Paul is really rocking! That’s very cool! Thanks for sharing that with us. Which ones did you buy? Back in July 2011, (yes I was one of the early adopters!) I was following noahsdad.com and getting very anxious at the level of therapies which seemed to be available in the US compared to here so I sent a PM to you guys asking what services Noah received and Abbie sent me back this WONDERFUL email which listed the services – (where does she get the time!!) – but MORE IMPORTANTLY she said ” the point of these sessions are not to help your son progress so much, but to help us learn what activities we should be working on at home every day. You are the best therapist for your son.” and she gave me the names of three books (under your developmental section Books 1 -3) on early communication skills, fine motor skills and gross motor skills in children with Down Syndrome. These books are excellent – not the sort of book you sit down and read from cover to cover but you find out the level you kiddo is operating at and then there are lists of home activities which you can do to help them progress. The three books cost me approx €45 (I got them on Amazon) but they will be referred to again and again…. Thanks again Abbie (and Rick) not only for the books but also for the encouragement! Keep up the good work!! It is our pleasure to help out 🙂 I am glad things are going well. I agree with you on how to use those books. By the way, here is the link that lists the books my wife and Alison were talking about. http://sweltering-berry.flywheelsites.com/top-resources/ Please let us know if you have any questions, or suggestions about anything on there. Those OT / PT books are very useful. I too have bought the books – and I do have resources available. The books do coincide with every therapy that Enzo is going through so I can definitely vouch that the books are good. I have Gross Motor Skills for children with Down syndrome, Fine Motor Skills for Children with Down syndrome and communication skills for children with Down syndrome. These are 3 great books and can be bought online. Best of luck Sonia…sounds like you’ll be chasing your little one around before you know it! @facebook-100000400548938:disqus Keep us posted, and please let us know if there is any way we can help / support you guys. Look at him, sitting tall and proud! What a big boy he is!!!!!!! It was so cute when my two kids started to sit up on their own, how they would fold in half. I’m still amazed and in awe of the flexibility of babies. We all compare, even amongst siblings, I know I did. I’m proud of my son (16) for the way he looks out for me (I’ve been having some medical problems) and his care and concern for me almost makes me want to cry sometimes. I’m proud of my little fireball daughter (5), that’s her in my avatar, for how fearless she is. She started competitive cheer leading in the fall, and her squad of first timers marched out onto the mats like they’d been doing it forever, and that was in front of a crowd of over a thousand people! What a sweet kid to take care of his mom 🙂 I hope that you are doing better. Thanks for the support! My 9 yr old has Asperger’s, hypotonia, motor skills deficits, dysgraphia, sensory issues, speech & language deficits, among other disorders and syndromes. He cannot pedal a bike, walk down the stairs correctly, play on playground equipment easily or tie his shoes. He gets very tired walking short distances and even when just standing for a few minutes. Comparing him to other children in his class or even to his nieces who are the same age would be so easy to do. Yet, over the years, I have learned that he will do things on his own time and there are SO many things he does really well that other children do not. He is in accelerated reading and math. With a Heavyweight Pencil his handwriting has gotten as good as any other child in his class. Instead of focusing on what he cannot do or cannot do as well as his peers, I prefer to look at all he has overcome, continues to overcome and how hard this lil one tries. He has to/has had to work so much harder than neurotypical children to get where he is. We are talking two, three times (sometimes even more) as hard as his NT peers. He is so strong, so resilient and so innovative and adaptive when figuring out how to do something ‘his’ way. I have learned to give up my expectations for him and have just allowed him to set his own pace and I follow. I am so proud of him! He has exceeded all of our expectations for him! He is just amazing! I am now going through the same thing with my 10 mo old. He started PT just before missing his crawling milestone. He has already been diagnosed with hypotonia and is showing signs of possible sensory/motor skill problems. I have had to do the same thing with him ~ allow him to go at his own pace and not have any expectations of a “perfect” child. This time it has been a no brainer for me (with my first it was much harder to let go) and he has done/is doing amazingly well! He ended up crawling before missing his milestone ~ a good therapist is worth their weight in gold. You can either look at this life we, and they, live negatively or positively. You can cry, rage and spend your time wishing (and constantly comparing) your child was just like everyone else’s or you can celebrate your child, his differences and each step forward (and sometimes backwards) he takes and just love and appreciate them for who they are and who they are and who they will become. It’s not easy, it can be heartbreaking at times, there will be tears and times where you just want to rage at the world (or the insurance company/teacher/school system/specialist/family member/friend/spouse, etc). You learn to wipe away the tears, dust yourself off and just keep taking one step at a time. It is so worth it, believe me. That is a great comment! I hope we can all choose to be positive as you are doing for your kids. One of the amazing things you can not teach is determination. Therapists, teachers, friends, have all said it, if you child has the “want” you can always find a way to make it work. Perseverance and determination will serve you and your child well! James is a sitting champion. He could totally win awards for it. And he wasn’t too happy when I started plopping him down on his tummy. But now he’s working toward the champion military crawler award! It’s so cool to put him in one spot…and a few minutes later, he’s not there any more! I do compare, and I do get frustrated. Sometimes I think, “Oh, well. No one ever asks, ‘When did your kid understand pictures on a flashcard?’ so it’s no big deal that it’s later than typical kids.” But then I realize: you know, some things he may NEVER do. So I don’t have to be okay just with delayed accomplishments, but with maybe unachieved accomplishments. I have to be okay if he never makes it to thin liquids or if he can’t cook a meal for himself as an adult. And really, that’s fine! It just redefines what we’re all taught about what’s important in life. Seriously, a society that prides itself on acting like none of us need each other has issues. @facebook-9210823:disqus I agree with my wife…that is a great comment. It the end of the day we need to just trust the Lord and take life minute by minute; day by day. I can relate to the comparison game. Other days I realize I’m not sure where other two-year-olds are for a specific milestone, but I know that Grace is making progress, that she’s further along than a month before. This post speaks perfectly to me…I nanny 2 toddlers with DS. The 21-month-old just started walking on his own, while the 28-month-old just started moving forward in her walker. Two totally different children, but both being equally celebrated this week! That is awesome!! What a cool job you have. How awesome that you were both there! GO Caleb!!!!! I’d like to have a wee brag about my wee 5mth old grandson Matai who has DS. This week he started to roll from his back to his front, after doing a warm up of crunchies with shoulders head and legs held up off the floor. He is very nosey to see everything and very strong and determined. He was so proud of his accomplishment and now does it over and over, always followed by a beaming grin. We all think he is so clever. We are enjoying watching Noahs journey too and find it very inspirational. It is good to see what is in front of us and ideas to try out. What a lovely post and it is very true, we need to take the time to sit back and enjoy the accomplishments – “we” have an SLT appointment tomorrow and I have just sent her some videos I made recently of him “singing”!! and only then did I realise how vocal he had become! Sometimes it is hard to see the wood for the trees!! It is so hard not to compare, for me sometimes it is because I want to make sure I am doing everything I can for James. But thank you for this post. I want to celebrate today and the fact he is sitting so well and that he gets everywhere he wants even if he is not crawling yet! I am so proud of him! That’s awesome, thanks for the kind words and for sharing with us. How old is the boy with Down syndrome that you care for? Is there any milestone that is as awesome as that first smile? (And Noah has one adorable smile!) It’s the milestone that is worth daily celebration. So exciting! it’s so easy to forget to celebrate the little things when we get caught up in the day to day and looking at our neighbors. Thanks for the reminder to celebrate our successes! I’ve read your fabulous blog for a while now, but never posted a comment before. My son with DS is now 5 (and totally brilliant!) and only this week has worked out how to do ‘thumbs up’ – I don’t think we even realised he couldn’t do it! Once he’d mastered it (after about half an hour trying!) he got it and now does it all the time! You’re right in saying we shouldn’t compare (but we do! ) but when I stop comparing I see all sorts of wonderful achievements 🙂 Love that feeling! Keep up the good work Noah! @726a61fc315a6aa05b7a6b471f56f489:disqus awwwww.. I love this! How awesome. I’d love for you to share a photo of him doing the thumbs up! You can post it here in the comments, or on our facebook page. I agree. It is so hard not to compare. But know that everything you are doing is making a positive impact on your son’s life and that he has his very own timetable that is just right for him. I am so inspired by your stories of Noah. I am a mother of 5, grandmother of 7 and will be adopting a newborn with Down Syndrome in June. I feel hope and inspiration by reading your stories and watching these videos of your wonderful little boy. Finding this site has helped me to realise that just because my new child is challenged, difference is okay and through love we will be a strong, determined family with so much to celebrate. Can’t wait to hear more about your story 🙂 where are you adopting from? its a private direct placement adoption. The girl pregnant has been a friend for several years, she was going to have an abortion and I wanted to adopt. I didn’t know at the time that the baby was going to have down syndrome, now im just trying to learn as much as possible & try to be prepared. I’m worried and scared but also full of excitement and anticipation. Thanks for sharing this. I LOVE this idea and enjoy being able to celebrate Noah’s accomplishments too. Our Lila is almost 10 months, and after spending her first 55 days in the NICU and three major surgeries, followed by heart surgery in November, she is progressing well. She might not be where other babies her age are but she too is strong and determined! She came home from the hospital with a feeding tube but with a lot of work and effort, she is now even holding her own bottle and enjoying baby foods. She is not yet sitting but we are working on it and eagerly awaiting the time we can celebrate that accomplishment. All children – regarding of the obstacles they face – develop and learn at their own pace. And those milestones deserve celebration. Kudos to you for doing just that, and for sharing it with the rest of us. It sounds like your little one is rocking it. 🙂 You must be very proud. It’s funny that you mentioned this…as I read it in the wee hours of nursing, I was thinking back at Enzo’s therapy session. It was the BEST one yet….but wait…aren’t they all? I kinda feel embarrassed to admit, but I go the therapies and I write down what needs to be done, what he’s doing, etc….and I do forget to remember just how far Enzo has come! And let me tell you…he has come a long way BABY! That is a great idea!!! That way you can see the progress. Thanks…I actually do see such great progress. I like how much Noah and Enzo are very much a like in their progress. What is that toy called? I have been looking for something like that for Luke. He is 2 years old and cannot sit on his own..He is very close to victory. It is the Little Superstar Jammin Band with Musical Microphone. “Holland?! ?” you say. “What do you mean Holland?? I signed up for Italy! I’m supposed to be in Italy. All my life I’ve dreamed of going to Italy.” But there’s been a change in the flight plan. They’ve landed in Holland and there you must stay. The important thing is that they haven’t taken you to a horrible, disgusting, filthy place, full of pestilence, famine and disease. It’s just a different place. So you must go out and buy new guide books. And you must learn a whole new language. And you will meet a whole new group of people you would never have met. It’s just a different place. It’s slower-paced than Italy, less flashy than Italy. But after you’ve been there for a while and you catch your breath, you look around…. and you begin to notice that Holland has windmills….and Holland has tulips. Holland even has Rembrandts. But everyone you know is busy coming and going from Italy… and they’re all bragging about what a wonderful time they had there. And for the rest of your life, you will say “Yes, that’s where I was supposed to go. That’s what I had planned.” And the pain of that will never, ever, ever, ever go away… because the loss of that dream is a very very significant loss. I love that poem 🙂 It is always a good reminder. We got it shortly after Noah was born. Sorry to hear about the loss of your son. I bet that was a fantastic celebration. To compare your child to a “typical child” is normal. I catch myself comparing my two girls who are 2 years apart. They are “typical children” but they are so different from each other. Comparing is what we do to see where we are in any kind of development. For over a year after my son Kevin was born he was a project to me more than a child. Than one day I realized that he was my gift from God. I believe with everything in me that my son, who is 24 now and has DS, was given to me because I needed him as much as he needed me. I won’t go into detail because it’s a long story. He has taught me more than I ever taught him. He is an inspiration to my other children who are more aware and accepting of someone who may be different. He also touches the lives of my children’s friends and they are better for knowing him. I enjoy watching Noah grow. I wish this kind of support had been available when Kevin was little. I went to several support groups that first year but it seemed like most of the evenings were crying sessions and after I finally accepted Kevin as my child, I quit going.You obviously adore your child but I can tell you, you will make many more discovery’s about parenting a child (with or without special needs). It’s a frustrating, wonderful, scary, exhausting, but worthwhile journey that never ends. It looks like most of the people who follow your site are parents with very young children. I’ve been where all of you are and I love reliving Kevin’s formative years thorough you and your children. @0016cd128a5847402d558516cdab79cf:disqus Thanks for your comment. I’ve worked with teenagers for over a decade now, so I know what you mean. Parenting in general is challenging. 🙂 It sounds like you guys are doing a great job. We actually a have a wide range of families that read our site. Are you connected to our Facebook page? Tons of people there of all ages, it’s awesome. I know what you mean, Rick! I would compare my other children, too! I think it’s natural (not good) but in most people’s nature. I have decided that with, Reuben, I’m going to try my BEST not to compare…He WILL do everything, just when HE is ready…and i’m telling you, it really does make it all the SWEETER when they do! So no more comparing and I will instead celebrate the fact that he is also a sitting champion! He no longer needs pillows around him in case he should lose his balance. And he is a champion eater! We were told he would have a lot of trouble with eating since he was tube fed for so long and also has Hirschsprung’s disease, but he did master first the art of breastfeeding, then had no trouble with puréed/mashed food and we are now working on little pieces. So kudos to Noah and all of our children! @8b056430a3dd2239f3269f30d56f10e4:disqus Sounds like a great idea! Thanks for your comment. How old are your children by the way? Our grandson Patrick is walking!! He can stand up with no support and toddle right along! He turned 2 and the end of November and we could not be more proud of him! His sister Caitlin is working on holding her head up ans strengthening her neck muscles. She just turned 5 months old. Wow that is awesome! Congrats!! I know you guys are proud. How often does Patrick go to OT? makayla can do some of the hand motions to etsy bitsy spider, open and shut them, twinkle twinkle and she just started rolling her arms for the wheels on the bus! That’s great! Noah is a huge fan of both of those songs. 🙂 Does Makayla smile and laugh real big when you’re singing? This is just what I needed today. Thank you! 🙂 Thanks. I hope your day is going better! What something you can celebrate today? It’s one of the Catch 22’s of being a special needs parent. You always have to be ready to list off all the things your child CAN’T do (so they don’t cut your services or so doctors take you seriously) and yet, you know how damn hard they work to achieve each milestone that you have to always remember to celebrate what they CAN do instead of focusing on what they can’t. It’s hard to be able to switch those gears when necessary. Yay for sitting up! That is a huge, hard skill!! Thank you for sharing. I’m new – joined recently. My daughter is 4 months old and we also dont get a lot of support from special services too. We are proud that she’s making good progress and doing well with her health. It’s awesome to hear of Noah’s accomplishments..gives us hope! How did you guys hear about your site? How often does your daughter go to therapy? A month ago I was big as a house pregnant with my fourth child,Nico..I was cooking dinner when your family came on tv and I stopped to listen to your amazing,positive story..I was moved over the wonderful things you had to say about DS & your beautiful son Noah. Little did I know that in a few days during my wonderful home birth my son would also be born with DS.I knew tho when I scooped him out of the water he was special and the amazing bond we share began.I wasn’t scared or upset I just knew everything would be ok.I knew he may struggle but that I would also do everything possible in this world to help him achieve anything he wanted. We struggled the past few weeks with breastfeeding due to his low muscle tone but I am here celebrating him now full-time nursing,no bottle! !We did it and we did it together,I never doubted that he would accomplish this.it just took a little team work and I foresee this as our path in life,teamwork..
My 5 year old claims “we scored the perfect baby”yes,yes we did. Thankyou for having a positive uplifting place that I can learn and share my amazing child..
Wow, thanks so much for telling me how you find our site! That’s really cool. I’m glad you connected with us. Have you checked out our Facebook page? (http://facebook.com/noahsdaddotcom) feel free to post a picture on there, we love seeing pictures on there. 🙂 What channel did you find us on? Do you guys live around Dallas? 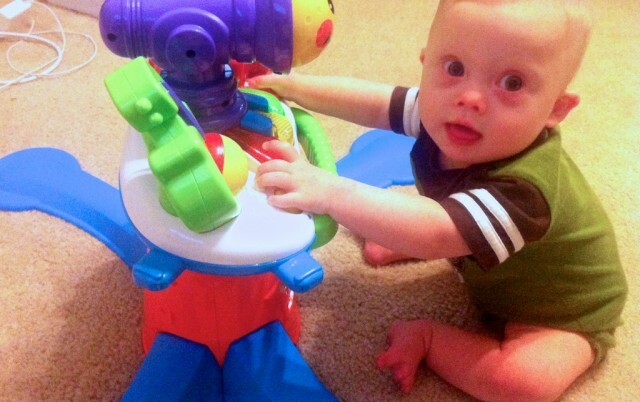 @1597a4793c158fe70dfb850943badeb1:disqus A baby play group…..that sounds awesome. How many babies end up coming to the play group? There are seven in my daughter’s class. Each week, the group (with parents) has a 1.5 hour class, with 1/2 hour physical therapy, 1/2 hour music therapy, and 1/2 hour speech therapy or occupational therapy (alternating weeks). I think it is great. I am so thankful to you all, i just learned about this website yesterday, and I can’t stop looking at all the beautiful children just like Luke…I am in Corsicana, TX, just 50 miles south of Dallas. Luke is 2 years old now and I would love to get involved with some of the other parents. Does any one know of a good therapy place open after 5pm or on weekends around DFW? We currently have PT with ECI once a week and OT with ECI once every two weeks..
Chelsea is 7 1/2 months old. Today she impressed her therapist by reaching up, grabbing a toy and shaking it ferociously all while sitting with support. We are still working on sitting up alone. Go, Baby! What sort of toys do you guys use in therapy? I agree that celebrating as opposed to comparing is a great perspective. I try to use that philosophy with the teenagers I work with, because their life revolves around comparing themselves with each other, the ideal self portrayed by the media, and even their own perceptions of what they think their parents, friends, etc. think that they should be. @63035a0b18c6cb87082ab8be9203d27a:disqus I agree. 🙂 What sort of teenagers do you work with? Thanks for the kind words! I love how you posted a picture of your child! That rocks! He looks like such a fun dude. 🙂 How old is he? I’m not sure where you got the idea that ‘normal’ kids just have to learn something, like sitting up, once and then just do it all the time. I had three biological childen (and raised several others) and they often learned a skill, back slid a bit, relearned the skill, etc. Even with a ‘normal’ kid you have the tendency to compare your child with others and worry, i.e. Jimmy can climb stairs and Suzy can’t and she’s two months older! (but maybe you forgot that Suzy lives in a one story house and Jimmy’s home has stairs). Your little guy has two loving parent and with those amazing blue eyes will go far as he enjoys this world you are helping him grow into. Having said that, parents of Downs or any ‘handicapped’ kids do have a longer list of things to worry about, heart problems, etc. and more work, physical therapy along with ballet classes and t-ball schedules to deal with, but the Downs kids I took care of did pretty much what my kids did, baked cookies, went sledding, played games, read stories and liked having them read to them. They sometimes needed extra help at first, but everyone had a great time, it wasn’t that big an adjustment, and the so-called disabled kids wemt to school, acted like teenagers when they got to that stage and eventually grew up to have jobs, too. Are you the parent of a child with special needs? Thanks for the post, it’s very important to remember that comparing can be so counteractive. Sure, it’s useful to know the areas where our kids might be falling behind, but at the end of the day, they’re doing things at their own speed and the best we can do is be there for them, challenge them and help them grow. Not to say that I haven’t struggled immensely with this (and still am) – but it sure helps to hear other people’s stories! Our first son has Williams Syndrome and when he started to walk on his own over xmas (being about two and a quarter years old), I was immensely proud of him and so excited (relieved too). He still has much to learn in terms of walking, but it makes me very happy to see him stolper around, as I can tell he enjoys the freedom and new perspectives it gives him. Aiden is climbing the stairs on the slide (that are too far apart for his short legs) all by himself and going down the slide on his belly!!! He’s also talking!!! Saying new words everyday….so so sooooo proud of my mamas boy!! !